An 11-year-old boy with a rare form of cancer has been sworn in as an honorary police officer. Alex Goodwin has Ewing Sarcoma - a childhood bone cancer. 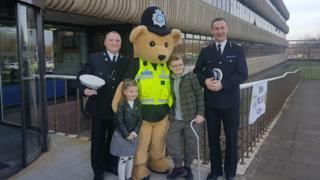 Lincolnshire Police made him a "mini officer", complete with uniform and identity card, at a ceremony at its headquarters. Assistant Chief Constable Shaun West contacted Alex after reading about his treatment on a blog written by the Leicestershire schoolboy. "I have followed Alex's Twitter for some time and I think he is an amazing boy," said Mr West. "I was touched by his posts about his cancer journey. I know Alex and his family have had some difficult times." Alex, was given just months to live in October 2016 after being diagnosed with Ewing Sarcoma. He has since received life-saving treatment in the USA, including further chemotherapy. He has also had complex, pioneering surgery where his right femur and knee were removed and replaced by a telescopic prosthetic bone. He returns for checks and further treatment at the hospital in Kansas City every few months. Alex said he was thrilled to become a mini-police officer with a special responsibility for wildlife, due to his love of birds. "I love every single animal on this planet, " he said. "I like learning about them, but I love birds, because their sounds make me really relaxed."